The Fraser River Estuary, of which Roberts Bank is a critical component, is a major stopover for millions of Migrating Birds. Read more about its importance and to understand how Terminal 2 will likely impact this critical stopover on the Pacific Flyway. In addition read about the importance of the Fraser Estuary to Salmon and other fish species. The current Roberts Bank container port has led to the loss of near shore feeding habitat for juvenile salmon and Terminal 2 will do even more damage. The overhead powerlines along the Deltaport Causeway, which run perpendicular to the Flyway, are are an ongoing cause of bird mortality. Port Metro Vancouver committed to bury these powerlines a long time ago, but they have never done so. A good example of their lack of commitment as far as resolving environmental issues. Traffic chaos - Massey Tunnel is already a huge bottleneck. 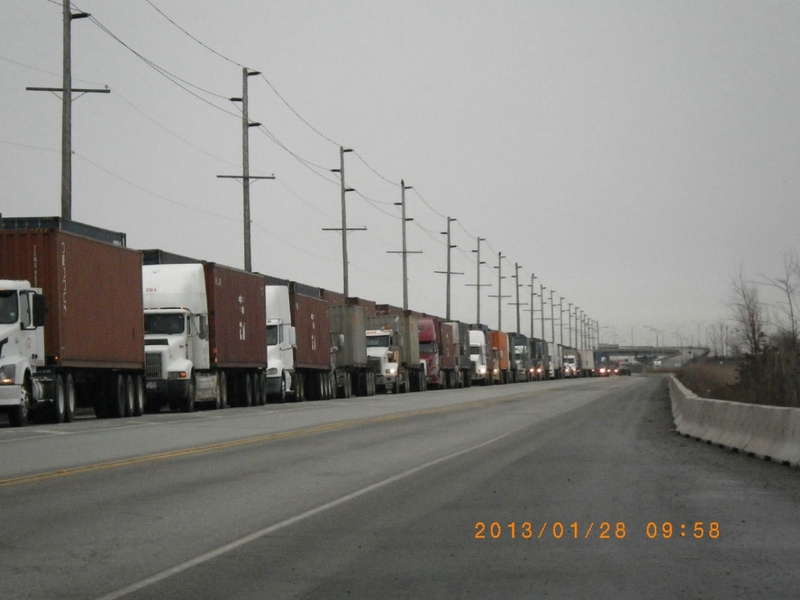 Port Metro Vancouver indicates there are today (2013) 3500 container trucks traveling to and from Deltaport each day. Today about 60% of those trucks head for the Massey Tunnel, which is already over capacity. PMV has stated that the South Fraser Perimeter Road (the southern route of the Gateway Program) will solve the traffic chaos yet most of these trucks will still use the Massey Tunnel. The situation will get even worse if Terminal 2 (T2) comes to fruition. That expansion will triple the number of containers passing through Delta. That's three times the amount of trucks bound for the Tunnel. The proposed Gateway project does not address these northbound trucks. There are no specific plans to add capacity to the George Massey Tunnel and a replacement is probably at least ten years away. There are no plans in sight for increasing the capacity of the George Massey Tunnel. Noise and light pollution from Deltaport and transportation corridors. With the increase in container trucks, comes an increase in truck noise along highway corridors. At the same token, more trains lead to more noise along the rail corridors. Neighborhoods closest to the port will experience even more noise from ships' engines and the shunting of trains. An expanded Deltaport means an expanded lighting system. Lighting from the existing Deltaport is already a source of annoyance to people living within sight of the port. Concerns have been raised by both government and environmental groups about the effect the lighting will have on fish migration and behavior. The night lighting raises concerns of nocturnal predation on juvenile salmon by visual predators. Keep in mind that Roberts Bank is located in the Fraser River estuary; the Fraser River being the greatest salmon-producing river in the world. Three-fold increase in air pollution - a proven cause of lung diseases and cancer. By 2011, when the Deltaport Third Berth Project is complete, there will be exhaust emissions from 2400 diesel trucks each day. In addition, 400 container ships per year will be spewing toxic emissions into Delta's air shed. By then, the Deltaport facility will exceed GVRD standards for particulate matter, especially PM 2.5 which is harmful to human health. This toxic pollutant has been linked to lung cancer, asthma and other respiratory and cardiac conditions. Once the proposed second phase of port expansion (Terminal 2) is fully operational, there will be three times the number of trucks, ships and trains polluting our air shed with toxic emissions. Fraser Valley residents will also suffer the effects. After all, Delta's polluted air gets funneled straight up the Valley, along with the rest of the smog from the city. No cumulative effects assessment of all related projects (as required by law): Deltaport Third Berth impact assessment was never done. Under the revised environmental assessment legislation what hope is there for a proper assessment of Terminal 2 (being fast-tracked); expanded BC Rail yards, new lines and upgrades; container yards etc. Section 16(1) of the Canadian Environmental Assessment Act requires any screening or comprehensive study to include consideration of any cumulative environmental effects that are likely to result from the project in combination with other projects or activities that have been or will be carried out. In other words, environmental assessment studies of Deltaport expansion plans should be weighed in with past, present and future port development, including the related infrastructure projects that will service the port. In the case of Deltaport's Third Berth Project (DP3), this has not been done. During the public comment period of DP3's environmental assessment, many people and groups raised the issue that the cumulative effects of T2 had been excluded from consideration. Before the end of the process, the Vancouver Port Authority (VPA) withdrew their application for Terminal 2; thereby omitting the necessity to incorporate the cumulative effects of "uncertain" expansion plans. It's interesting to note that even after the letter of withdrawal, VPA was still romancing the business community with talk of T2 and its speculative economic benefits. Other related projects that were not duly included in the cumulative effects assessment of DP3 are the South Fraser Perimeter Road, the container storage yard being hosted by TFN, and the 17-track rail marshalling yard near Arthur Drive and Deltaport Way. Loss of globally-significant habitat for salmon, migrating birds and endangered orcas. This photo, taken on October 31, 2007, shows thousands of snow geese resting on the western shoreline of the Deltaport causeway. Concerns expressed by Environment Canada and DFO scientists have been ignored. In response to the environmental assessment studies for Deltaport's Third Berth Project, Environment Canada issued a 31-page report outlining many flaws and insufficiencies. has substantive concerns with the Deltaport Third Berth proposal, in particular because of the risk that it will act cumulatively and negatively with existing project impacts upon the marine habitat and fish and wildlife assemblages of Roberts Bank….there would be public outrage as well as agency embarrassment on an international scale. ...will not be involved in any review of the Deltaport proposal as the only option proposed for that project results in the destruction of critical fish habitat... because of the critical value of the fish habitat in the area of the proposed expansion, DFO would not be able to issue a Fisheries Act Sec. 35(2) authorization for the destruction of habitat. In November, 2004, behind closed doors, the federal and provincial governments, the Tsawwassen First Nations and the Vancouver Port Authority made a deal to remove 1,154 hectares (2,850 acres) of protected foreshore and waterlot from the designated Roberts Bank Wildlife Management Area on Roberts Bank and to transfer title from the provincial government to the federal government to be managed by the Vancouver Port Authority. This was done in secret with the Tsawwassen First Nation (TFN) through a Memorandum of Agreement and a Settlement Agreement. There was no environmental assessment as required by Order-In-Council 908, the B.C. Environmental Assessment Act and the Canadian Environmental Assessment Act. No fiduciary responsibility was exercised towards other First Nations who have claims to this territory. There was no mitigation or compensation for the fish and wildlife habitat removed from protection. Habitat destruction that cannot be properly mitigated may precipitate the collapse of the ecosystem. The chain of migratory birds of the Pacific Flyway could be broken. Negative impact on agriculture, fishing and tourism industries. According to the Census of Agriculture in 2001, Delta received 23% of the GVRD's gross farm income. Almost 50% of Delta is farmland. Rich deltaic soils coupled with a mild climate provide excellent conditions for soil-based farming that produces a variety of field vegetables crops and pasture lands for livestock. Every removal from the Agricultural Land Reserve impacts negatively on the viability of farming in Delta. Delta is ideally located for tourism as it is on-route for people traveling between the mainland and Vancouver Island. There are numerous areas for scenic walks along Boundary Bay dyke, Ladner Marsh, the Delta Nature Reserve and the Reifel Bird Sanctuary. Large populations of migrating and resident shorebirds, waterfowl and birds of prey make this area unique for wildlife viewing. Industrialization of this area for port activities will negatively impact this spectacular most significant Important Bird Area (IBA) in Canada. Roberts Bank, at the mouth of the Fraser River, is a large expanse of intertidal eelgrass beds, marshes and nutrient-rich mudflats which provide vital habitat for fish and other wildlife. This area is important for wildlife species at risk including coho and sockeye salmon, orca whales, Steller sea lions, white sturgeon, green sturgeon, and other listed species. Industrialization of over 1000 acres of ALR - threatens the viability of farming in Delta. In November 2004, the Tsawwassen First Nation and the Vancouver Port Authority signed the TFN-VPA Memorandum of Agreement, an unprecedented $47 million deal that addressed past and future port developments including agreement for a container handling facility on negotiated treaty lands that are currently in the Agricultural Land Reserve (ALR). In addition, plans for the South Fraser Perimeter Road call for the exclusion of 260 acres from the ALR. Loss of “quality of life” for the 55,000+ residents in the neighboring communities. Living next to a massive port facility comes with a price. Delta's air shed will be polluted with toxic emissions spewing from ships, trains and container trucks. Rail yards and container storage facilities will take the place of productive farmland. Delta's notoriety for being an environmentally rich farming/fishing community will be overshadowed by the blighted infamy of becoming an industrialized port city. All of this leads to a decline in property values of Delta homes. Increased risk from marine accidents - a major accident could destroy the Fraser River estuary ecosystem forever - salmon, orcas and migratory birds. Deltaport is located on Roberts Bank, which is front and centre of the Fraser River Estuary. This estuary provides habitat for migrating birds, fish (including salmon), and the endangered orca whales. Any type of marine accident puts this globally significant area at serious risk. An oil spill, bunker fuel spillage or even a capsized container ship (like the February 2007 incident of the Napoli off Devon, England) could cause irreversible damage to this highly sensitive area. Deltaport has no protection from the strong windstorms that blow directly off the Strait of Georgia. Over the last few years, severe windstorms have battered Delta's dykes and beaches. In 2003, gusty winds blew down two ship loaders at the Roberts Bank facility. One toppled into the ocean, and the other fell into the side of a ship being loaded. The risk is there. History proves it. With such high stakes, why are the provincial and federal governments willing to gamble it all away? Gateway infrastructure costs estimated to be $10.9 billion. The Pacific Gateway Strategy Action Plan (2006) has a supply chain infrastructure of 34 projects that it wants to complete by 2020 to capture the rapidly expanding Asia-Pacific trade. It builds upon the BC Ports Strategy vision released in March 2005. Both strategies depend on enormous expansion of the transportation network (road and rail) through the Greater Vancouver Regional District. Much of the estimated up to $10.95 billion total cost of Gateway will be born by taxpayers. The inter-causeway ecosystem on Roberts Bank is under threat from erosion and pollution resulting from port development. The inter-causeway is the foreshore (beach) area between the BC Ferry and Vancouver Port (VPA) causeways on Roberts Bank. This area is being starved of both water and deposits from the Fraser River. This is largely the result of building the VPA causeway in 1968/9 but has been exacerbated by port development and expansions since then. First, the long VPA causeway to the coal and container port starve the inter-causeway ecosystem of tidal washes of Fraser River water resulting in a risk of pollution and eutrophication. This appeared to have happened in June 2003 (see photos). Second, deep dredging into the inter-causeway foreshore for the enormous ship turning basin was done against an independent Federal Environmental Assessment Panel's recommendations in 1979. The consequence is that new delta foreshore is no longer being built into the Georgia Strait. In fact with the up and down tidal wash the inter-causeway on Roberts Bank is eroding not extending the Fraser River estuary. The consequences are not only loss of vital habitat but also loss of protection for Delta from global warming induced rises in sea level. The effects on the inter-causeway area should have been monitored since port expansion in the 1980s. This was reiterated by the VPA's own Project Environmental Review Panel in 1996 stated that there needed to be "a process for studying and monitoring these effects over time …" but nothing has been done. A key study in the VPA's Environmental Assessment for Deltaport Third Berth was to have been a biogeochemical study of the cumulative effects of port development on the inter-causeway ecosystem. There was no such study instead the VPA and government agencies promise future monitoring dressed up as an Adaptive Management Strategy. Meanwhile, we appear to be losing habitat on the front and centre of the Fraser River estuary and also risking pollution of what still exists. Further, we are witnessing erosion of protection for the community of Delta from the predicted consequences of global warming. Given the established, international, ecological values of Roberts Bank, Canada is running the risk of an environmental catastrophe of global significance. All of this for port expansions that are not needed. Without any further expansion at Deltaport there will be Canadian west coast port capacity of 11 – 12 million (containers) TEUs, which exceeds the demand projected by the Provincial Government of 5-7 million TEU's by 2020. It is also well in excess of Port Vancouver’s latest estimate of 8.8 mill TEUs. Yet Port Vancouver is still moving ahead with Terminal 2. When all this is over, the port will be 400 percent larger than it is today.